Yesterday was the 9 year anniversary of my 1st date with Al ....awwwwww if my friend Miss Tracy is reading this I know you are doing the finger down the throat thing pmsl.How things have changed in the last 9 years......we have stood by each other through alot over that time,the good and the bad.To think that people said we would never last makes me laugh everytime........we are still as in love as we where in the start.....he is still my very best friend and no one comes close.Ok enough of the lovey dovey stuff. Love this LO Krissy! Just gorgeous! I hope you & Al have a great Easter! Hi Krissy!! This is one gorgeous layout!! I love the colors!! I hope you have a wonderful Easter weekend!! TFS! Happy Easter Krissy - hope you and Al have a wonderful time with your family and friends. 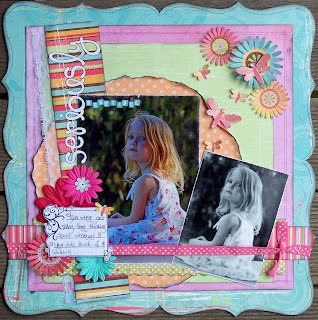 Love your pretty sketch layout and that butterfly card in the previous post is devine!